The Smartline® system employs rollers that run atop a stationary saddle affixed to the press tie bars, eliminating wear and the need for grease. Using the Smartline System, molds with critical parting line alignment run longer without maintenance. Leader pins and mold alignment components last longer. Clean molding applications run without greasing the tie-bars. Smartline Mold Carrier and Alignment System supports the center section of stack molds eliminating friction and tie bar wear. Conventional support systems use sliding tie bar pads that need grease and wear press tie bars over time. B sides of injection molds are not commonly supported during use. Heavy molds sag slightly causing wear to: leader pins, alignment components, and platen bushings. Over time, mold maintenance costs may become prohibitive. Smartline Mold Carrier and Alignment System supports the B-Side parting line of single face molds, dramatically reducing repair costs and downtime. Injection molders are constantly challenged to make smaller parts with a high degree of complexity and accuracy. Any wear of shut-off points and ejector pins can cause bad parts or broken mold components. This frequently causes production shut down, increased mold repair costs, and lost profits. Smartline prevents excessive wear to highly accurate molds by repeatably aligning all parts of the mold with the tie bars on the press, ensuring perfect alignment without appreciable wear. 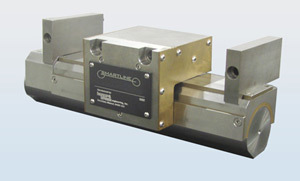 Smartline Mold Carrier and Alignment Systems reduce: mold downtime, mold repair costs, press repair costs (tiebar wear).